We, the workers, are the union. Unions are made up of workers standing together for better working conditions, pay, and respect in the workplace. Unions are how we show our power we have as workers when we come together. When we stand together we can actually address some of the larger problems we all face in the workplace here at the airport. With all of us working together we have more power. One way we show our collective power is by bargaining a contract as a union. Another way unions build collective power is by fighting for minimum wage laws, overtime, and other workplace protections. Both ways are important. What really matters though is that when we are alone, management gets to decide what to do with us, but together we can push back against the problems we have at the workplace. PHOTO: Mayor Ed Murray, Sea-Tac airport worker Socrates Bravo. “Please take what we did in Seattle and export it across the country,” Seattle Mayor Ed Murray told a crowd Wednesday during a panel discussion on the minimum wage at the Center for American Progress. It’s official. Workers at Bags, who serve Alaska Airlines customers, at Sea-Tac Airport celebrated as the votes were counted in a Union election. We won! Our day in court for $15 for SeaTac! Last November, airport workers pushed for and won a $15 minimum wage at Sea-Tac Airport. Alaska Airlines and the Port of Seattle sued blocking over $15 MILLION in wages for 4700 families. On June 26th the Washington State Supreme Court was hearing final arguments in the $15 for SeaTac case —and we were out in force to show our support for airport workers getting the wages they deserve. 4700 workers at the airport have lost nearly $15 Million in wages in the last year because Alaska Airlines and the Port of Seattle said “nope” to the $15 initiative fought for by airport workers and approved by the voters of SeaTac. Seattle fast food workers, and community allies came to the airport with a message. "Grounded" See the film about Sea-Tac Airport workers Alaska Airlines won't want you to see. At Sea-Tac Airport, Alaska Airlines and the Port of Seattle are creating prosperity for some--but economic hardship for others. 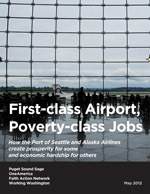 Download the full report on poverty-wage jobs at our airport.